“It was the best of times, it was the worst of times, it was the age of wisdom, it was the age of foolishness, it was the epoch of belief, it was the epoch of incredulity, it was the season of light, it was the season of Darkness”, writes Charles Dickens in his novel, A Tale of Two Cities. The two cities, Dickens has in mind are Paris and London. We, Christians are also living in a Tale of Two Cities. The Bible refers to the two cities as Jerusalem and Babylon. We are part of an epic drama that involves our eternal souls. Wang Ming Tao, a famous Chinese Christian taught us to always check our life with a spiritual thermometer so that we will be spiritually healthy when the Lord comes. The shaded boxes gives a visual aid to the state of our spiritual life, our spiritual temperature. Are we on fire for the Lord and are we stone cold? This is the Afterword in my forthcoming book, Into the Depths of Living Water. The book you are holding is the latest at trying to share the gospel of the good news of Jesus Christ in a different format. I hope you have enjoyed it and in some ways be edified by it. Writing is hard and gruelling work. It is incubated amidst blood, sweat, and tears. No, these aren’t the ink I write with. I just want to express that it not just physically challenging, but mentally too. The thought of all the work frightens me, as it involves transferring all those ideas that I carry with me in my mind, into words. Ideas brew and form, and run ahead of writing—writing about them is akin to playing ‘catch up’. Such imagery is enough to make me feel breathless. Writing, especially in an authentic voice, makes me exceptionally vulnerable, as my inner thoughts and aspirations are made bare to the world. Such glaring spotlight is not easy on me—an extreme introvert. So why write? Putting all things on a balance, I sense that a net effect is at work, to pull me towards writing as the means to share my ideas with a wider audience. I hold dear a vision to nurture disciples of Jesus Christ who possess informed minds, hearts on fire, and are contemplative in actions. This process of orthodoxy, orthopathy, and orthopraxis are the foundations of my writing. The process of becoming like Jesus Christ is necessarily a holistic one, as we strive to live out the faith in everyday situations, in the various roles we play in community life. In attempting to address such needs, the scope of my interest and writing inevitably takes on a multi-faceted approach. It draws upon insights from theology, biblical studies, spiritualities, spiritual formation, spiritual direction, biomedical ethics, culture and the arts (poetry, literature etc. ), science and medicine, popular culture (movies, computer games etc. ), parenting and Christian living. At first blush, these seem very disconnected ideas but all of these can be mined for lessons on spiritual formation—the common theme that undergirds my writing. My editor, Shu Phay, encouraged me to share something about my writing journey. Initially. I was very reluctant because my journey is not over yet. I believe I have still a number of books inside me to be written. However, after mulling it over during a retreat, I have decided to share a part of that journey that God has unveiled thus far. Thinking about why I write what I write humbles me—I must aim, at all times, to be a good messenger and steward of knowledge. And yes, I must keep the interest going, to explore and use the most suitable media or technology to communicate with you, dear readers. For readers who may want to get to know me through my writings, please read on. There could be common interests, you and I, and I welcome exchanges and collaboration. This is a collection of articles where I experimented with different approaches of writing to connect with my readers. I wrote from the first, second, and third persons on issues that concern me as a Christian doctor, such as depression, suicide, euthanasia and cloning. This book is a Christian response to controversial and emotive issues of euthanasia and end-of-life concerns. I gave my response from the lens, as well as from the ‘heart’ of a medical doctor. I shared some perspectives to guide Christians to think about this: We live well. Shouldn’t we also die well, with dignity and minimum pain and completely at peace with life’s rhythm and His will? Here, I injected insights and knowledge from my medical career and theology education to make sense of scientific processes relating to the termination, design and creation of life—abortion, stem cell research, cloning, and transhumanism. I got started on this book after a period of observation about the Church’s attitude to technology and new advances. It seemed to me that there is a general skepticism on new technology, and I ponder if the rejection is a gut reaction— a crippling fear of the unknown blocking attempts to view it rationally and with theological basis. This book is an attempt to fill the gap at a time when response papers were typically written by systematic theologians, rather than Christian ethicists or medical practitioners. This is a work in progress and the book, admittedly, is a bit dated. One day, I shall get my lazybones to update it! Travelling further on my journey in spiritual formation and transformation, I began to realise that many Christians shun the active, intentional formative processes of their faith communities because they are too busy. Somehow, there is an entrenched view that we can only grow spiritually if we are ‘unbusy’. My thoughts were on busy people as I wrote this—hence the short chapters with a key takeaway in each, to be ‘consumed’ on the go. It is my conviction that the Holy Spirit can cause spiritual formation and transformation in very busy people—people who are always on the run. I contributed a chapter on problem-based learning (PBL) in theological institutions. When researching and writing this, I discovered a valuable area—how people learn—and have not stopped thinking about this since, the theory and applications to the Church. A significant milestone in my journey of writing and discovery. Jesus told parables. Parables are stories that have multiple layers of meanings. Stories are a powerful media of communication, cutting through our filters and worldviews. This book represents an attempt to communicate biblical truths through stories. Set in the fictitious Sow Lin Monastery headed by Abba Ah Beng, the book follows a group of mischievous disciple monks (and one girl) on their life adventures (misadventures too) musings, and ‘learning moments’. The book was delightfully illustrated (with cartoons) by Han Seng Lim. I am grateful that many people, both young and old are blessed by it. It is presently in its fourth printing. This is an academic tome based on my PhD work on spiritual formation. It provided the opportunity to formalise and disseminate my ideas about learning, spiritualities, spiritual formation and transformation, and discipleship in Christian faith communities. Kids are at the heart of what I do; parenting and grandparenting are issues close to my heart. I thought that the idea of a series of letters to my granddaughter would be a great medium to convey parenting advice in a post-modern age. It has proven to be very popular. A companion volume on letters to my grandson is being written. This is a collection of meditations on 1 Chronicles for Asian Notes, originally published by the Scripture Union. I thought it is useful for people, especially busy people, to have access to the materials in a handy, compact booklet. I have in recent years begun to develop photography as a spiritual discipline, to train the mind and eyes to focus in looking and seeing, and in the process, learn to perceive the world differently. I want to be closer to the Creator by appreciating the beauty of his creation. I have noticed lately that people take in information better if it’s presented visually or as short sound bytes. Thus birthed an idea to develop a four-part series, each a photobook devotional. The first two books contain photos taken in autumn in Kyoto, Japan and summer in Alaska respectively. This haunting song by Loreena McKinnett has been ringing in my head as I read about the state of the world through my newsfeeds. I am been trying to understand the meaning of the song. But first the lyrics. The Phrygians (gr. Φρύγες, Phruges or Phryges) were an ancient Indo-European people, initially dwelling in the southern Balkans – according to Herodotus – under the name of Bryges (Briges), changing it to Phruges after their final migration to Anatolia, via the Hellespont. From tribal and village beginnings, the state of Phrygia arose in the eighth century BC with its capital at Gordium. During this period, the Phrygians extended eastward and encroached upon the kingdom of Urartu, the descendants of the Hurrians, a former rival of the Hittites. Meanwhile, the Phrygian Kingdom was overwhelmed by Cimmerian invaders around 690 BC, then briefly conquered by its neighbour Lydia, before it passed successively into the Persian Empire of Cyrus the Great and the empire of Alexander and his successors, was taken by the Attalids of Pergamon, and eventually became part of the Roman Empire. The last mention of the Phrygian language in literature dates to the fifth century CE and it was likely extinct by the seventh century. My initial exposure to the Phrygians came from my reading about the ancient Greek and Roman history. Having been in Turkey (ancient Anatolia), I can remember standing there and looking at the beautiful blue sky. A particular stanza from the song resonates within me. Sometimes we ask where God is in the face of so much suffering in the world, not realising that He is here all the time. He feels our pain and our sorrow. He suffers with us as the world drags its feet to the end of time. Henri Nouwen like many great spiritual directors was a letter writing. This is an excellent compilation of his letters on the spiritual life. 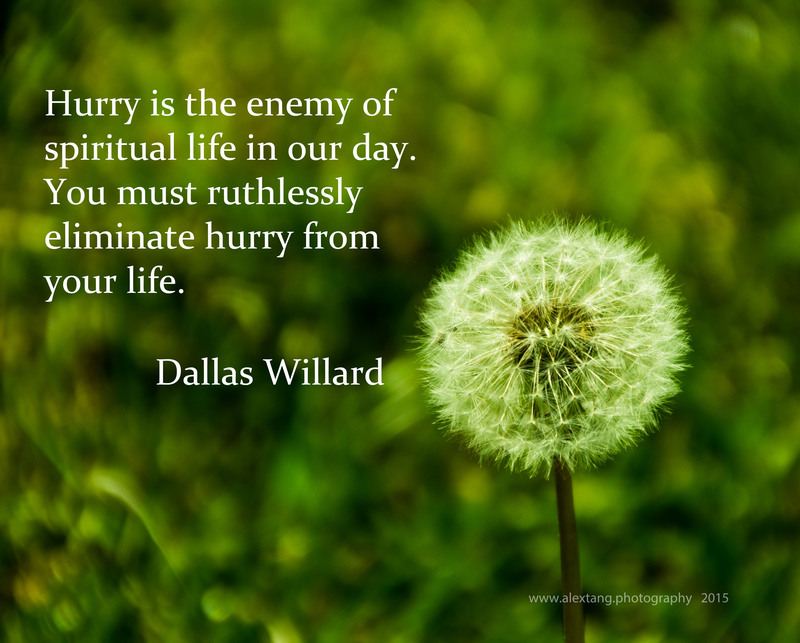 Spiritual formation or growth must take pace at a slow, steady and unhurried pace. It is never in a hurry. Hurry hinders rather than help spiritual growth. This does not mean spiritual growth cannot occur in a busy life. There is a deep distinction between busy and hurry. Busy is having to do many things. Hurry is an emotional response. It is stressful and distracting. Busy to having to complete many tasks. Hurry is rushing to complete many tasks in the shortest possible time with undue pressure placed on oneself. Pierre Teilhard de Chardin (1881-1955), a Jesuit priest and scientist wrote this prayer for his niece and still relevant today. to something unknown, something new. Calvin and Hobbes is a daily newspaper comic strips series drawn by Bill Watterson in 1985 about a 6 year old boy with a toy tiger named Hobbes. In this script we are introduced to Calvin’s world or reality where Hobbes is a real wise-cracking tiger. We are also immersed into the life of his long-suffering parents, his school and school friends. After Peanuts by Charles Schulz, Calvin and Hobbes is my favorite cartoon strip series. My enjoyment of the series (which stopped in 1995 when Watterson decided to stop drawing the strips) comes from identifying with the worldview of this little boy and his pet tiger. First, Calvin and Hobbes enjoy life. Every day is a wonderful adventure to them with new possibilities and wonders. Whether exploring the woods near their house, overdosing on sugar while watching Saturday morning cartoons on television or playing in his room, there is always place for creativity and enjoyment. They are not worried about consequences. Life is to be seized and every ounce of enjoyment squeezed out of it. Second, Calvin has a very developed imagination. 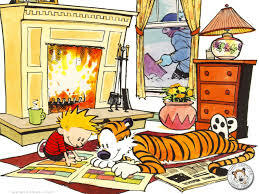 Watterson highlights this in the comic strip when Calvin and Hobbes are drawn in simple outline, Calvin’s imaginary worlds are very detailed and colorful. The fact that Calvin is not aware that Hobbes is a toy tiger is a tribute to the strength of his imagination. Calvin escape into his imagination when he is face with unpleasant situations such a boring lessons in school, eating vegetables in mealtime, doing homework (who likes homework anyway), and in the school principal’s office. In his imagination, he becomes a spaceman, a flesh eating dinosaur or have a machine that ‘trans-mogrifies’ things. Third, Calvin and Hobbes has a unique way of looking to everyday things. They have a wonderful sense of wonder than transforms the ordinary into the extraordinary. A cardboard box becomes a time machine or spaceship, a packed lunch becomes a horror inducing stuff to scare girls, or the many unique ways of building snowman by producing panoramas. Finally, the friendship and loyalty of Calvin towards Hobbes is heartwarming. Though they bicker and fight (note: never fight with a tiger with claws), the scenes when Calvin lost Hobbes (Hobbes was later found) was heart rendering. The Gospel according to Calvin and Hobbes is about enjoying life. Life is to be enjoyed with gusto, imagination, wonder and friends. Yes, Calvin has to live in a limited world of a 6 years old with its rules and boundaries set by his parents and school. That to him was never an obstacle but a challenge. I wonder whether this applies in our Christian life. The Christian life is enjoyable when we know God and obey him. God is glorified when we enjoy life with him. Since then, many Christians have objected to the word ‘Christian hedonism’. Dictionary.com defines hedonism as “the doctrine that pleasure or happiness is the highest good”. If being with God is the highest good, and pleasure and happiness results from it, what is wrong with using the word? Hedonism is not a bad word if it is used to describe the joy of living our life in God. Is Christianity a dour religion with no enjoyment, gusto, wonder or relationships? Apparently some Christians seem to think so.